AGM followed by Scottish Wildlife Trust: Championing, demonstrating and inspiring, by Bruce Wilson. Sixth of our winter series of talks. Bruce Wilson will give a talk on "Scottish Wildlife Trust: Championing, demonstrating and inspiring". Keeping the environment and wildlife prominent during uncertain political times: The environment is the key foundation for our society and economy yet huge political upheaval such as EU-Exit means that the environment can often end up playing second fiddle. 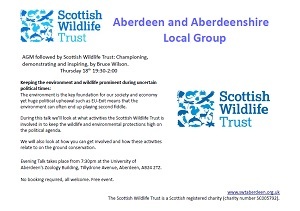 During this talk we’ll look at what activities the Scottish Wildlife Trust is involved in to keep the wildlife and environmental protections high on the political agenda. We will also look at how you can get involved and how these activities relate to on the ground conservation. Rare Invertebrates of the Cairngorms, by Gabrielle Finn. Fourth of our winter series of talks. 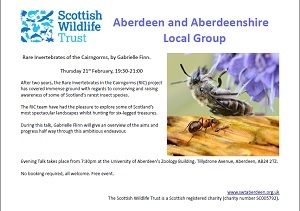 Gabrielle Finn will give a talk on "Rare Invertebrates of the Cairngorms". After two years, the Rare Invertebrates in the Cairngorms (RIC) project has covered immense ground with regards to conserving and raising awareness of some of Scotland’s rarest insect species. The RIC team have had the pleasure to explore some of Scotland’s most spectacular landscapes whilst hunting for six-legged treasures. During this talk, Gabrielle Flinn will give an overview of the aims and progress half way through this ambitious endeavour. Guided outing to Marycoulter Woods. The visit should be of broad interest: setting up a community woodland trust and aspirations for further improvements in biodiversity and for social and educational benefits. But there’s plenty of natural interest already and a geologist to answer any questions about the rock outcrops & land forms. Meet at the forestry road access, Grid Ref. NJ 862 991. If coming from the South Deeside Rd, B9077 or Netherley Road, B979, drive south up the hill past the church to Kirkton of Maryculter. Just passed Oldman Rd on the right, take the next left turn. The meeting point is approx. 500 metres after the turn, passed the bridge over the Crynoch Burn on the right hand side. There is ample parking. Welcome to the Aberdeen and Aberdeenshire Local Group of the Scottish Wildlife Trust. As a local branch, we organise a number of activities for members and the general public in the North East of Scotland. An evening of Bats, Haddo House. Early Morning Red Squirel Watch. What makes our Citizen Science Buzz; photo submissions and online identification of our bumblebees. New Local Nature Conservation sites in Aberdeenshire. Pearls in Peril - securing the future of the freshwater pearl mussel. We're part of the Aberdeen Joint Winter Syllabus, who organise a wide range of events - please see the syllabus programme for further information. Created and maintained by SJW Enterprises.